LISTEN NOW to this Isaiah 17 study. May take a moment to download to your media player. This edition of Prophecy Update Radio, host Bill Salus teaches from the commentary section of his soon to be released book, Revelation Road, Hope Beyond the Horizon. This special radio program features a verse-by-verse study of the entire chapter of Isaiah 17 regarding the destruction of Damascus. In light of ongoing revolts inside Syria, many end time experts are predicting that the Bible prophecies contained in Isaiah 17 could be about to find final fulfillment. To enrich your listening experience the verses of Isaiah 17 are provided below. Read along with co-host pastor Dave Hart, who reads the verses and then turns the microphone over to Bill for his commentary. Some of the verses below have parenthesized emphasis, which applies to Bill’s teaching. Isaiah 17:1 – The burden against Damascus. 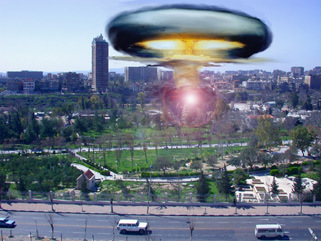 “Behold, Damascus will cease from being a city, And it will be a ruinous heap. (v2)The cities of Aroer are forsaken; They will be for flocks Which lie down, and no one will make them afraid. Isaiah 17:3 – The fortress also will cease from Ephraim, The kingdom from Damascus, And the remnant of Syria; They will be as the glory of the children of Israel,” Says the LORD of hosts. Isaiah 17:4 - “In that day it shall come to pass That the glory of Jacob will wane, And the fatness of his flesh grow lean. (v5) It shall be as when the harvester gathers the grain, And reaps the heads with his arm; It shall be as he who gathers heads of grain In the Valley of Rephaim. (v6) Yet gleaning grapes will be left in it, Like the shaking of an olive tree, Two or three olives at the top of the uppermost bough, Four or five in its most fruitful branches,” Says the LORD God of Israel. Isaiah 17:7 – In that day a man will look to his Maker, And his eyes will have respect for the Holy One of Israel. (v8) He will not look to the altars, The work of his hands; He will not respect what his fingers have made, Nor the wooden images (Asherim) nor the incense altars. Isaiah 17:9 – In that day his strong cities will be as a forsaken bough And an uppermost branch, Which they left because of the children of Israel; (IDF) And there will be desolation. Isaiah 17:14 – Then behold, at eventide, trouble! And before the morning, he is no more. This is the portion of those who plunder us, And the lot of those who rob us. Psalm 83:13-15 and Isaiah 17:13 use the same six Hebrew words of galgal, paniym, ruach, har, radaph, and suphah as comparatively parenthesized below. This suggests a connection between the prophecies of Psalm 83 and Isaiah 17.